Ex-owner Chris Wright has agreed a deal to sell his 15% stake in Queens Park Rangers following lengthy negotiations, according to chairman Bill Power. Wright is expected to sell his shares at the full price but give the club 50% of the money paid to him. Power, who took over as Rangers chairman in June, said: "Chris has finally made what we consider to be to be a good offer to sell his shares. "He'll give a significant amount of cash to the club. It's a nice gesture." It is not yet clear who will buy Wright's shares. But a Monaco-based group that purchased a stake in QPR earlier this year have first refusal. Wright bought Rangers along with rugby union outfit London Wasps in 1996 and formed Loftus Road plc. A financial crisis hit the company and Wright stood down as QPR chairman in 2001. He later relinquished his majority shareholding. 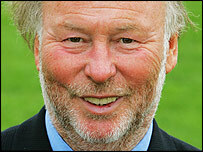 He retained a stake in the football club and remains the owner of Wasps, who now operate seperately. Meanwhile, R's boss Ian Holloway will make another attempt to capture Middlesbrough centre-back Andrew Davies. The 20-year-old was set to sign on loan before Christmas but Boro blocked the move because of injury problems at the Riverside Stadium.